A-Channel: A-Channel+smile is a couple of OVAs as a short sequel to A-Channel. Whether this can be strictly called a sequel or not, the characters are back for more comedic slice of life. Not much can be said of the story. Heck, it's a slice of life anime after all. A-Channel: A-Channel+smile is a direct sequel and side-story to the original series. Although there is no story, just watching the lives of these four girls is quite interesting indeed; especially the OVAs now focus more on character development and interaction than previously. The comedic elements are back with some cuteness from the characters. 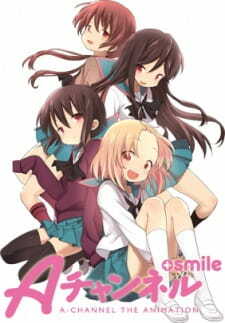 If you have watched A-Channel then you should definitely finish off the entire series with smile. To all those who haven't watched the original A-Channel then I recommend that you don't start this one until you have finished the prequel. The art is pretty much the same as before with nice details on the characters. The cuteness is back with some nice "moe" features. The backgrounds were well illustrated and the animation was fluid. Nothing else I can add here. Sound track was pretty much standard tunes for your average slice of life anime which included some peppy and energetic songs to go along with the introduction and ending to the anime. Voice acting was perfect as usual containing the same cast as the prequel. The same characters are back with the flighty Run, the reckless Tooru, the timid Yuuko, and the level-headed Nagi. Some more variety and character development is shown here. After watching the entire series, I've quickly forgotten what happened already in the anime. The story wasn't that memorable and I forgot why I enjoyed it. Perhaps it was the occasional pun or joke that kept me going till the end. Well, I would not recommend this to anyone if they have not watched the first series or enjoy slice of life anime. Again, there was pretty much no story here except the lives of these four girls. Same as A-Channel with some minor details being improved. Some cute voices by the same voice actors. There is nothing different this time although some more character development is established. As enjoyable as watching water boil. There may some unexpected bubbles but nothing to be memorable about. Well if you are into slice of life anime featuring a bunch of high school girls then you may enjoy this.